These 5 week old Saint berdoodle puppies are a little more energetic than purebred Saint Bernard Puppies. They are a little smarter and very quick and keen to pick up on things, especially when a treat is involved. The Saint Bernard is very intelligent as well, I just find that the Saintberdoodle is a little more intelligent, attentive and eager. That would be the intelligent side of the Poodle traits coming out in them. They love attention and are very happy and playful, thoroughly enjoying being your big cuddly lap dog/Teddy Bear. Look out when they are full grown they will be heavy! It is wonderful to have a large breed dog that sheds little, is hypo-allergenic (wavy/curly coats), does not drool, and has high intelligence. The Saintberdoodle is a large breed dog with just these qualities. What more could the large breed dog lover ask for. However, they do require additional grooming because of their coat type. Frequent brushing and trips to the groomers to be pampered can be expected. Now I know there is no dog that can be said to be one hundred percent hypoallergenic or that will never shed, but the idea of one that comes a little closer to this is what I really can appreciate. 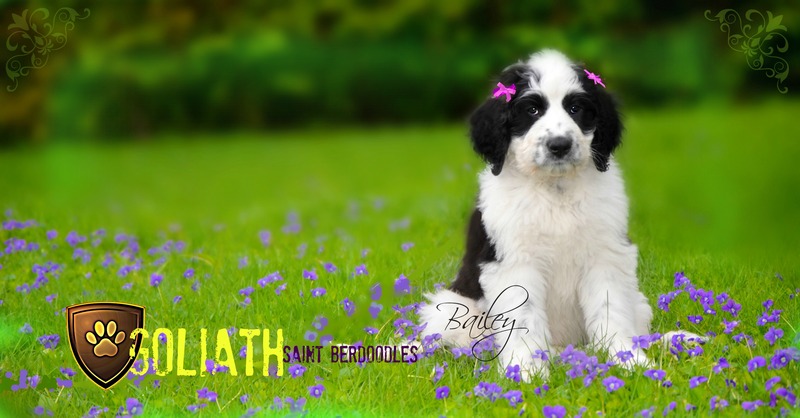 Smaller Saint Berdoodles are available for those who love the temperaments of the breed but not the larger size. The Saint Berdoodle has the temperament of both the Poodle and the gentle giant Saint Bernard, who are loyal family or companion dogs. They have non aggressive disposition but will alert their family of danger. 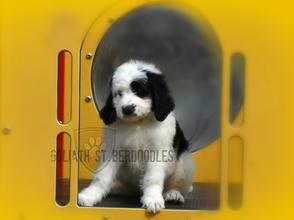 Goliath Saint Berdoodle puppies are the best family dog breed. The Goliath Saint Berdoodle is known as one of the top family dog breeds. This stated fact comes from families everywhere across United States and Canada who currently own a Goliath Saint Berdoodle. Besides the fact that they truly are really amazing family dogs, the Goliath Saint Berdoodle is also known for their no -drooling, non -shedding, hypo-allergenic hair coat qualities. No drool is a must to have in your large breed dog, which makes Goliath Saint Berdoodles one of the best Saint Berdoodle puppies out there.....is their no-drooling traits. 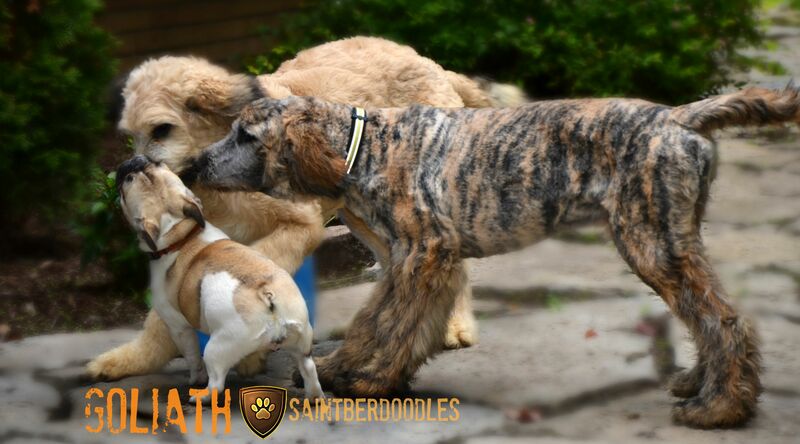 Goliath Saint Berdoodles are a no- drooling type of dog, which is a real super great quality to have in a large breed dog with a Saint Bernard in the mix. Goliath Saint Berdoodles No -drooling means... you do not have to worry about drool all over the house or in your vehicles, or having to carry a rag with you everywhere you go with your dog. Note some Saint Berdoodles do drool, but the Goliath Saint Berdoodle does not drool. 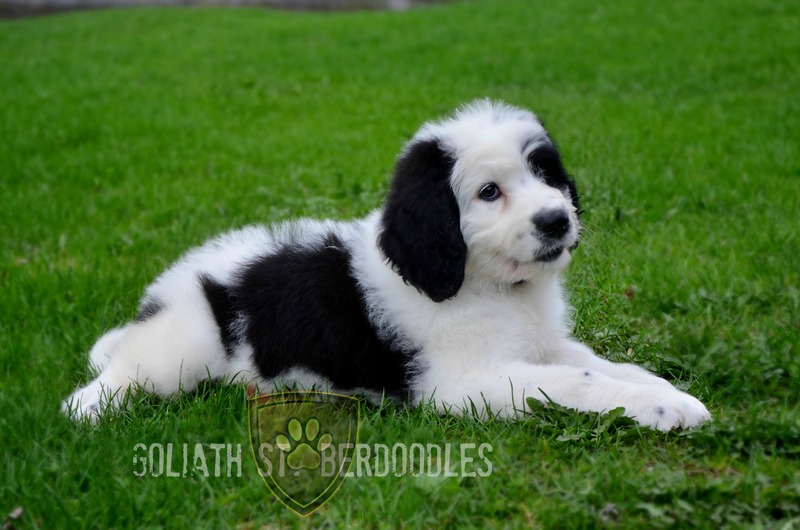 Goliath Saint Berdoodles come in various colors, but one of the most popular colors is the PANDA puppies colors, which are black and white color and usually have round shaped eye patches. Goliath Saint Berdoodles puppies are sometimes called Panda puppies because of their black and white markings that resemble the giant Panda Bear. 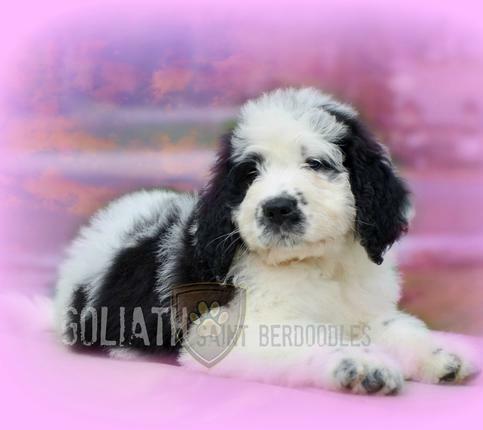 Goliath Saint Berdoodle puppies and Panda puppies are a beautiful large dogs but also come in small and medium sizes. 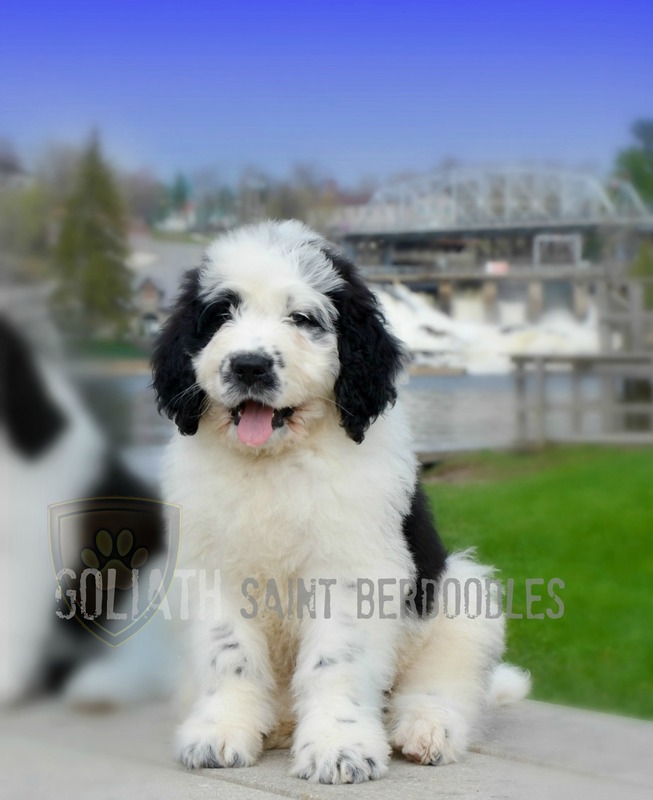 As is the giant Panda bear A SOFT CUDDLY looking Bear, so to is the Goliath Saint Berdoodle, a SOFT CUDDLY bear looking puppy that is wonderful with kids. For Air Shipping costs within Canada and U.S. please contact us FOR PRICING., over medium size crates. Our flat rate fee into the U.S. is $1300.00 up to medium size crates. Please Note. We book by appointment only. We do not put our address on our website for this reason. 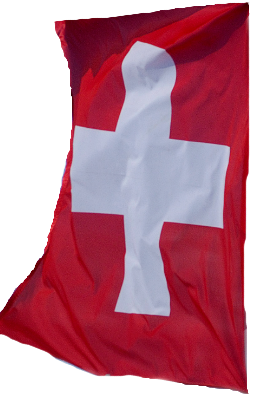 We have found in the past that families would show up early because of excitement sometimes at 6:30 am and even at 10 pm, and also in other families appointment times. We now have to give out our address on the day of the appointment visit for this very reason. Non Shedding, Hypo-allergenic No drooling, Large breed family dog is what best describes a Goliath Saint Berdoodle. For families who love the Saint Bernard Traits, but just not the size, we also breed Smaller sizes dogs, weighing forty to fifty pounds. Goliath Saint Berdoodles are THE BEST family dog, but besides spelling family dog. They are also great dogs for their following qualities....non-shedding, no-drooling, and great dogs for those with allergies. Please note straight coats may have shedding or minimal shedding. The curlier the coat are the best for non shedding and allergy sufferers. We have had short straight hair puppies great for allergies also. 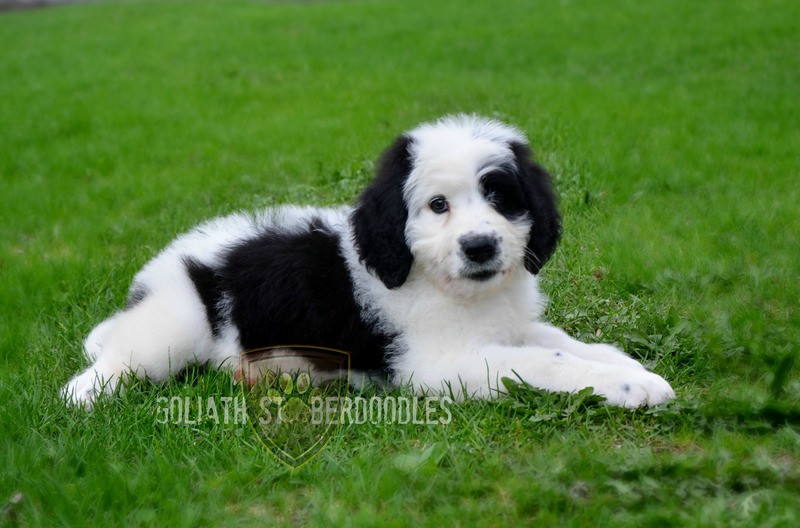 Anyone looking for one of the best families dogs of all breeds, who also want a dog who is a non-shedding, no-drooling, hypo-allergenic type of dog may want to consider a Goliath Saint Berdoodle puppy. A dog who is excellent with Children. Highly intelligent very easy to train, calm, quiet and very well behaved naturally. What is the best family dog? 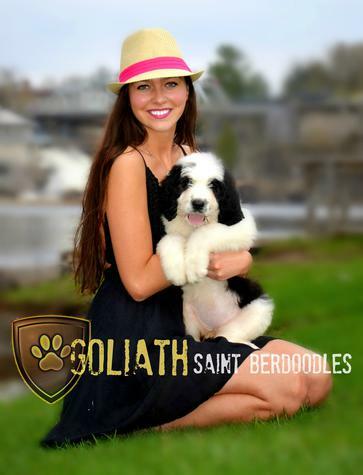 Goliath Saint Berdoodles are the Best family dog "Our Saint Berdoodles are just that, family dogs. Goliath Saint Berdoodle puppies ...Non shedding, Hypo-allergenic, and no drooling. Superb family dogs. 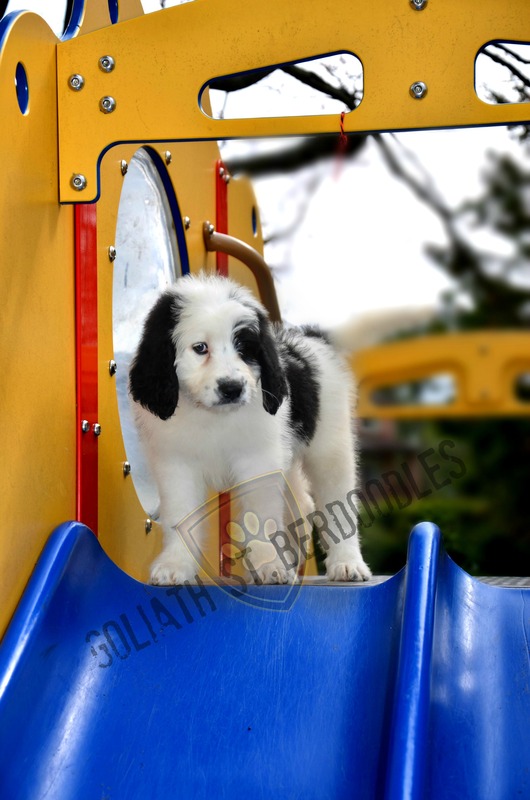 The Goliath Saint Berdoodles Panda puppies are not a breed, but color and markings of the dog. Panda puppies are Black & White markings of the dog which resembles that of a Panda bear. Panda puppies and dogs are not limited to only one particular breed. The Panda dog only represents the color and markings of the dog. There is no new breed of Dog that is called a Panda Dog. We do not dye our puppies to support the fad, and do not wish to promote those breeders who do. There are breeders who do have lovely puppies with the Panda markings that occasionally are born in a litter. These are rare occurrences, and when a puppy is born looking like the beautiful Panda Bear people do sit up and acknowledge the rare markings.